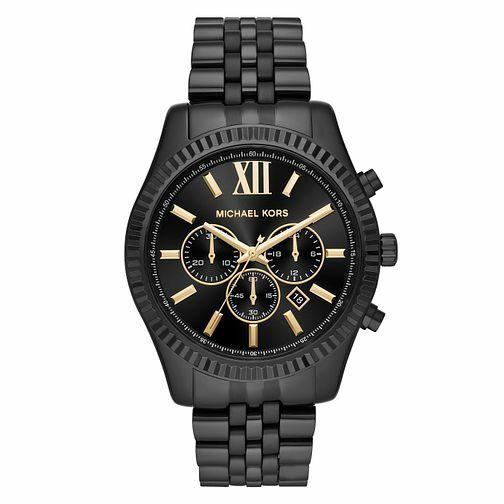 Keep yourself organised and in style with Michael Kors Lexington with a stylish black ion plated bracelet, case and a dial that contains three additional subdials, and carefully marked indices to keep you on time and in style. Michael Kors Lexington Men's Ion Plated Bracelet Watch is rated 2.5 out of 5 by 2. Rated 1 out of 5 by Anonymous from Not great Unfortunately I’m Not entirely happy as the box was battered. There is no certification note. I have brought this brand and style of watch from other retailers previously in different colours, they all had certifications with the product and packaging was to very high standards. This was initially brought as a gift for my other half but it looks second hand so I don’t really want to give it him now. However buying from Ernest Jones was the cheaper option. Rated 4 out of 5 by Anonymous from Good Nice watch for a gift, however I did find the watch felt light/cheap but the overall look is nice.